This beautiful and a high energy school situated in the rural area of Darshan nagar, Faizabad caters to the rural students to provide them quality education and empower them to be at par with the remaining world in terms of opportunities and skills. 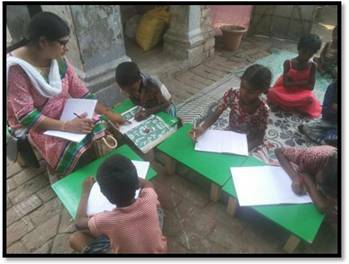 This Hindi medium school is a CBSE affiliated school providing education at a highly subsidized fee and as per the requirements of the rural folk. 62 students are provided free education. The curriculum is holistic and caters to the overall blossoming of the physical, mental, spiritual, socio-emotional and cognitive domains of development. Books and stationery is provided free to all the students. Excursions and Field trips to places like Lucknow, Shravasti, Gorakhpur, Allahabad, Bhimtal etc. are provided free of cost. Expensive yet important development exercises of Adventure camp for developing leadership abilities by Altitudes Expedition Private limited, Delhi is provided free. The library stocks more than 5000 books. 24 hours internet and electricity is provided to the students for comfortable learning time and keeping them abreast with the wide ocean of knowledge provided through internet. Well equipped Science and Computer labs support students to engage and learn fruitfully through modern education tools. Annual free health checkup is provided by experienced medical practioners. Students are given opportunity to participate in local and national competitions like NCSE, Olympiads, sports etc. 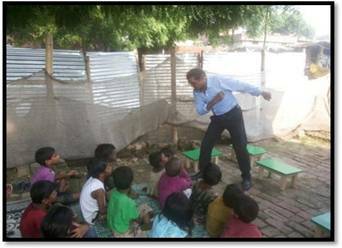 by providing them free coaching, travel and bearing other expenses involved for the same by the school. Alumni engage in developmental activities like distribution of free books, bags, copies besides providing career, health and games related expertise. The teaching methods, curriculum and infrastructure is at par with any standard school but catering to the local needs , language and purchasing capacity of the locales so that they develop, get empowered and yet do not loose touch with their immediate world. The brightly litup eyes, the exuding confidence and faces gleaming with excitement is an everyday sight at Aamar school. This school came into existence in the year 2016. Mr Rahul Deveshwar working for solid waste management and cleaning of Faizabad was brought here by KK Charity foundation. He came across a ragpicker basti in Hasnukatra where migrant ragpickers from Assam many of them being Bangladeshi refugees resided. Their children assisted their parents in picking up useful and saleable garbage. They were not going to school. We opened a school for these children as an endeavour to bring more hope and opportunities for a better life. A meeting was arranged with the parents and it was left to them to decide time, name and venue. A shack was built by them. Time was kept in the evening after children were free from their other commitments.The name decided by them was Aamar school aptly symbolizing ‘My school’. It was started with 25 students in the age group of 4 to11years and most of them being totally illiterate Some attended madrasas in the morning. 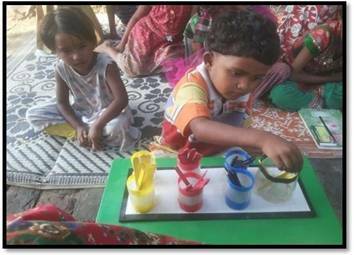 It was found that some of them were very keen and enthusiastic learners. They had high number and calculation sense in addition to a great grasping power. 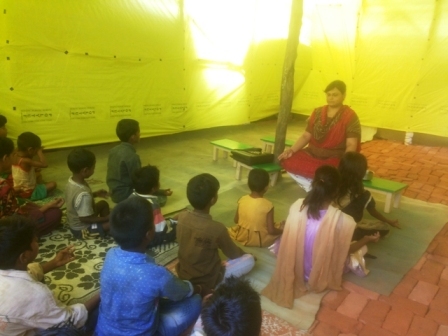 NTT trained Principal looks after the school and the programme is coordinated by Ms. Anjali. The curriculum is guided by the curricular needs of the children. They are fast learners and often their learning levels go beyond our expectations. Besides academic engagements they learn lifeskills, dance, music, games etc. They go for field trips and experts of various fields volunteer give them meaningful exposures. Three students with high performance and zeal to learn more were identified and are now put in the mainstream education at Yash Vidya Mandir and have beautifully blended with other students and the curriculum. They are being provided free education with stationery, dress, transport and other requirements. In the evening, they attend Aamar school where support is provided in doing homework and afterschool self study. The strength of the students is rising continuously and it has reached 35 in the current session. 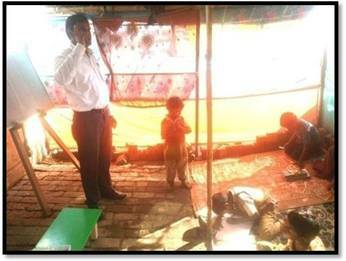 Parents and their community in the basti are providing strength in terms of cooperation and confidence in the efforts. We look forward to extending it to many more children as education is the way to empower them to a more fulfilling and well informed life and career. Blessed are the children of Aamar school who are giving us opportunity for bringing light in some lives!